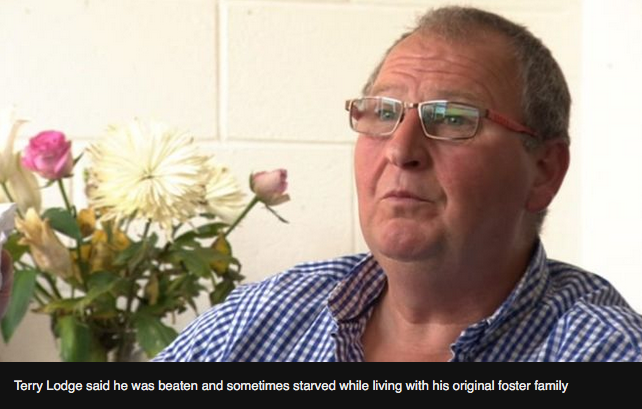 A man who said he was forced to work as a child slave after being taken into foster care has received an apology from his local authority. Terry Lodge, 55, from Bassetlaw, said he was forced to work in a foundry, when he should have been in school. Bassetlaw MP John Mann, who raised the case in parliament, paid tribute to Mr Lodge for his bravery. Nottinghamshire County Council said the quality of care he received was “unsatisfactory”. Mr Lodge said he was sent to work on a farm when he was eight years old and to a foundry when he was 11. He said he was forced to work by his original foster parents, up until the age of 15, and was beaten and sometimes starved while in their care. He said when he complained no-one came to help. Mr Lodge previously told the BBC that his childhood and adult life had been “spoiled”. Steve Edwards, the council’s service director for children’s social care, met Mr Lodge to apologise after the authority concluded he “suffered harm” after being placed in care more than 40 years ago. He said: “There were opportunities to protect him which were sadly not acted upon. A spokesman for the NSPCC said: “Victims must be able to speak out no matter who their abuser was, or how many years have passed since it happened.